Sara Raasch’s Snow Like Ashes was an unexpected gem for me. I was confident I’d enjoy it, but there were definitely some elements that bumped it up to a five star rating. To be honest, my first impression of kingdoms named after seasons felt cheesy, but after reading there’s absolutely nothing cheesy about it. Raasch has this skill to take wholly original ideas, add in incredible writing and create a novel I was hooked onto from the first page. 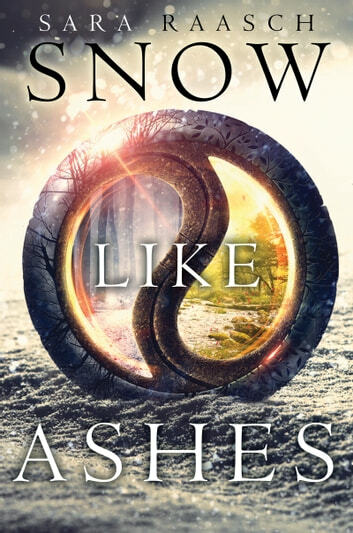 I went into this knowing it was a series and Snow Like Ashes has fixed me onto it; there are a select few books that can do this! Make no mistake, if I enjoy book one, I’ll definitely continue with the series, but I’m not usually fully-engrossed until book two or three. I loved the writing! Snow Like Ashes was a very fine example of 1st POV; the quality reminded me of Blood Red Road or The Hunger Games. I actually felt like I was in Meira’s head or even that Meira had a camera because everything she saw or experienced was described. I read an article by Rachel Starr Thompson called “How Writers Can Be Storyshowers instead of Storytellers”. To paraphrase, humans used to be storytellers so stories were told, with the majority summarized and action happening from a long-distance view. We really need to be storyshowers; writing in scenes and having our novel rely heavily on scene rather than summary (Thompson). Through talent and hard work, Raasch proves to be a storyshower. World-building and plot. I felt having ‘winter’ as the protagonist and ‘summer’ the antagonist was an interesting twist. I generally find winter is associated with bleakness, cold and long nights, and in some fantasy worlds winter is not something you want; the protagonist may even be fighting against winter/a winter-themed villain. Raasch provided a refreshing twist on this archetype. Additionally, whenever I had a question about the fantasy world (ex. which kingdoms have female blood-heirs and which have male), it was immediately answered on the next page or chapter. Using the example above, I wasn’t sure whether the Season Kingdoms had all female blood-heirs (as I knew Winter did) and the Rhythm Kingdoms had all male blood-heirs (I knew Cordell did), but this was quickly answered. Onto our main character, Meira. There’s always something about the protagonist that makes them extraordinary, but a lot of the times it can feel like they were born with this “something”. This isn’t necessarily a bad thing, but I sometimes feel like the main character is a hero/heroine before the novel begins. Lineage-wise Meira is ordinary - her parents were peasants, which is about the only thing we know about them (at least in Meira’s POV) - and it’s amazing to observe her go from ordinary to extraordinary. The back of the copy I read described this book as, “a hero in the making” and as I read I could actually believe this. As Meira builds her own destiny, her actions make her extraordinary. Moving on, Meira is a very conflicted character. Her country was destroyed when she was an infant, so she doesn’t feel any emotional attachment to it. This in turn created guilt, and character development like such was just as important as freeing the Kingdom of Winter. I really truly loved this debut! Tons of action, a conflicted but strong heroine, and great writing had me falling in love with Raasch’s fantasy world. There were some plot twists I did not expect - I’m usually pretty good at figuring out any/all foreshadowing - and there was one type of scene that had me pondering the dynamics/how it could be happening. I couldn’t decide if it was a dream, memory, or some kind of magic involved, but it stood out a lot to me! I’m extremely excited for the sequel, Ice Like Fire and what sort of challenges lie ahead for these characters! It's a well paced story that accelerates gradually until you can't put it down. Really, the plot is solid and the way it changes are ways I can appreciate. One of my best random buys. I give it 4.2 and not 5 because though the main character has a distinct and well expressed personality, many of the other characters could use more depth and development. I haven't read a book like this before and I absolutely loved it. It was something different and I really liked the concept of the book. I love Meira and her character and the strength and weakness that she shows. It had great aspects and a brilliant storyline, it kept moving and wanting me to read more. Looking forward to the next one! For anyone looking for a fantastic read, one that draws them into a world so fantastical and breathtaking, this is the one for you. Wholly unique setting and vivid descriptions definitely add character to this book, but my favourite aspect has to be the realism of the main character, of her thoughts and feelings throughout the narration. It might be cheesy to say (don't all reviews have something like this?) but it was impossible to put down.